Tina, you have a passion for what your doing, and that really helps solidify your unique phrasing – I quite enjoy how well it sits in the pocket – great work! I would suggest to focus more on singing on the consonants; in particular the ends of a word/sentence. Vocalizing the actual pitch on a consonant helps not only with energy, but also understanding of the lyrics, and most importantly, it helps to maintain pitch control at the ends of your sentences. Extra articulation with your lips will help kick start this concept. I am 52 years old. I started learning to play bass 7 1/2 years ago. I started singing and playing 2 1/2 years ago. 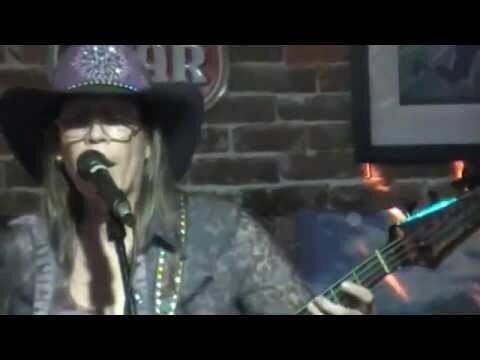 My vocals are stronger when I’m not playing.I grew up singing country music.When I learned to play bass I switched to blues/classic rock. The video is shaky and not on me at first. But give it a second. This was a jam and not my band. They did not know the song, so I had to bring it together.